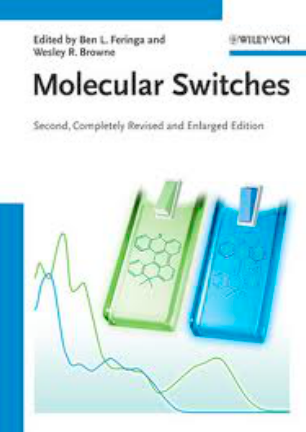 A selection of some recent advances on switching, assembly, autonomous motion, devices and molecular motors is listed. Highlights recently appeared among others in Chem. World, Science, Nature Chemistry, Nature Nanotech, Chem. Eng. News and parts of the work were covered in radio and TV programmes as well as newspapers worldwide like Die Zeit, Financial Times, NRC, and Frankfurter Allgemeine. The most important advances that were made include the design of a unidirectional rotary motor, the demonstration that indeed nanomotors could perform work and that one can drive, through continuous input of (light) energy a system out of thermodynamic equilibrium. (Designing systems that operate under conditions out of thermodynamic equilibrium is one of the major contemporary/and future challenges in chemistry). In molecular nanotechnology and supramolecular chemistry, control of dynamics, i.e. translational and rotational motion, is one of the most fundamental problems and challenging goals. Inspiration for this research is taken both from nature, where molecular motors are integral to nearly every key biological process, as well as daily life were motors and machines are ubiquitous. The early research in the Feringa group on molecular switches cumulated in the design and synthesis of the first light-driven unidirectional rotary motor in 1999. These are fundamental discoveries in molecular design and stereochemistry, which resulted in world-wide media attention. 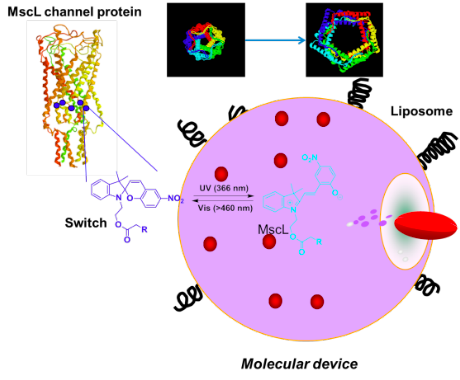 The subsequent design of the first surface bound light-driven unidirectional rotary motor and the development of a switchable nanovalve based on a light-triggered mechanosensitive hybrid membrane protein were selected by Chem.& Eng. News (ACS) as two of the most important breakthroughs in chemistry and molecular nanoscience in the year 2005. A major part of the research program has been focussed on Molecular Switches as the core elements of complex dynamic synthetic systems that can be triggered to induce motion or perform a variety of specific functions by the action of external signals. The Feringa group developed the first chiroptical molecular switches as early as 1991 (based on chiral overcrowded alkenes discovered by us in 1977); a nanometer scale bistable element which can function as a digital optical molecular information storage system. In addition this work demonstrated for the first time the concept of unidirectional motion in a molecular system. The systems proved to be particularly efficient as trigger elements to control the organisation of liquid crystalline (LC) phases in a fully reversible manner; an important findings in the context of novel display materials (in cooperation with Philips research). The first stereoselective switching process based on circularly polarised light (CPL) was demonstrated and a chiral amplification mechanism based on molecular motion, from CPL via molecular chirality to supramolecular chiral assemblies, established in 1996 (Science). Figure 1: Large array electronic device based on self-assembled monolayers of photoswitchable molecular wires. The diarylethene photo-switches have been developed by the Feringa and Browne groups to allow for electronic communication and dynamics to be controlled in a reversible manner. 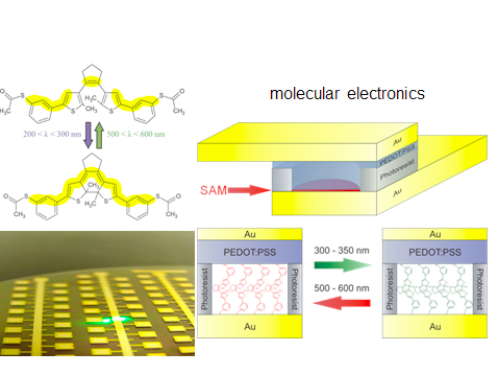 This class of molecule has also been applied to single molecule photoswitching of molecular conductance using the break-junction technique, switchable molecular wires), large array electronic devices (Adv. Mater. 2008) (Figure 1) and dynamic patterning of conductive polymers on surfaces. Furthermore, using chiral diarylethene switches in conjunction with hydrogen bonding functionalities, light-induced reversible transcription of supramolecular chirality into molecular chirality in self-assembled fibres could be demonstrated (Science, 2004). By designing functional overcrowded alkene type molecular switches, reversible three-state switching of luminescence, control of dynamic surfaces and surface patterning, dynamic assembly and switchable magnetic properties were realised. Molecular switches have been incorporated successfully in membrane channel proteins allowing for the realisation of a nanovalve to light and pH triggered opening of nanopores that are major components in cell membranes en route to smart drug delivery devices (Science, 2005) (Figure 2). Furthermore a bio-hybrid translational motor system was designed and the light induced control of the Protein translocation by the SecY lateral gate in a the membrane was recently achieved. Figure 2: Photomechanical nanovalve device based on hybrid protein channel with optical switch embedded in membrane of vesicle allowing controlled delivery. A recent example of the level of complexity that can be achieved with molecular switching functions by the research team is demonstrated in our recent report of the design and realization of a dynamic, complex self-organized system that is not only responsive to external signals but also multicomponent in nature (Figure 3). These self-assembled, vesicle capped nanotubes are selective disassembled by light (Nature Nanotech., 2011). The walls of the nanotubes are 3-nm- thick bilayers and are made from amphiphilic molecules with two hydrophobic legs that interdigitate when the molecules self-assemble into bilayers. In the presence of phospholipids, a phase separation between the phospholipids and the amphiphilic molecules creates uniform nanotubes, which are end-capped by vesicles that can be chemically altered or removed and reattached without affecting the nanotubes. The presence of an intrinsic photoswitchable and fluorescent core in the amphiphilic molecules allows fast and highly controlled disassembly of the nanotubes upon irradiation, and distinct disassembly processes can be observed in real time using fluorescence microscopy. Figure 3: Self- assembled vesicle capped nanotubes comprising two distinct amphiphiles that can be selectively de-capped or disassembled by light. Due to the presence of intrinsic optical switch and fluorescent core the disassembly process can be controlled by an external signal and observed in real-time. Our program on Molecular Motors has focused on control of rotary molecular and more recently also on translational motion culminating recently in the coupling of rotary and translational motion at the nanoscale. At the heart of a molecular machine is a motor unit which converts energy, be it chemical, electrochemical or light, to kinetic energy and allows it to perform useful functions. The protein-based molecular motors, found in the living cell, that have evolved over billions of years are amongst the most fascinating and complex of structures found in nature. The rapidly expanding field of (bio) nanotechnology sees increasing efforts to explore the function of these biotic nano-machines. Through the versatility of synthetic chemistry in a "bottom-up approach", in recent years a number of synthetic machines and motors have been developed that enable controlled movement, both translational and rotary, at the nanoscale. Two major classes of such systems are the mechanically interlocked rotaxanes and catenanes (Sauvage, Stoddart, Balzani, Leigh) and the overcrowded alkenes and biaryl based systems (Feringa). Furthermore, following the pioneering work by Whitesides and co-workers, catalytic propulsion of (bi)metallic objects (Sen, Ozin, Sanchez) and molecular based systems (Feringa group) has been demonstrated recently also. The research on molecular switches was the basis for the first light-driven unidirectional molecular motor (Nature, 1999) (Figure 4a). Distinctive features of this system, also in comparison to other approaches to artificial molecular motors, are that the consumption of (light-energy) results in unidirectional rotation in a repeated manner. This seminal discovery has led to the successful design of a second generation of molecular motors in which the speed of rotation was enhanced dramatically ( PNAS 2009). Recent efforts have culminated in molecular motors that undergo unidirectional rotation at room temperature at MHz rates (J. Am. Chem. Soc. 2008, highlighted in Nature Chemistry), a visible-light driven motor, a molecular gearbox and crankshaft. Figure 4a) First generation light-driven unidirectional molecular motor; b) second-generation molecular motor; c) azimuthal light-driven rotary motor on gold-surface; d)command surface with altitudinal motor on quartz. An important advance was the move from solution to surfaces via the self-assembly of monolayers of molecular motors on gold and the demonstration that unidirectional rotation on a surface can be accomplished (Nature, 2005) (Figure 4 c,d). This work formed the basis for a series of studies (Nature Nanotech, 2006) including the development of different methods for surface assembly, control of orientation (azimuthal or altitudinal) and trimer motor arrays. A major breakthrough was the demonstration that molecular motors can actually perform work and exert macroscopic effects. Specifically, a chiral molecular motor was shown to be capable of driving the reorganisation of liquid crystalline (LC) films providing for reversible colour change, (Nature, 2006); a finding of significance for LC colour pixel generation with light (PNAS 2002, highlighted in Science). A key finding is that the supramolecular system, comprising of a liquid crystalline phase and a nanoscale motor, can be used to perform work allowing for rotation of a micro-object on top of the soft LC film induced by the motor function (Figure 5a). The transformation of chemical energy into motion was also demonstrated in the first chemical driven unidirectional motor (Science, 2005). In this case a biaryl-based motor design was used and a catalytic asymmetric transformation to control clock-wise or counter-clockwise rotary motion. Several orthogonal chemical steps were still needed to accomplish a full rotary cycle, although the directionality of the rotary motion could be reversed by choice of reagents. In the result of efforts to build a molecular flagella a single rotary molecular motor was positioned at the end of a dynamic helical polymer rod. The rotary motion control the polymer dynamic and conformation, induces helix reversals and amplification of chirality while the motor drives the system out of thermodynamic equilibrium (i.e. non—equilibrium supramolecular system, Angew. Chem. 2007, J. Am. Chem. Soc. 2008). Figure 5a) Rotary molecular motor in Liquid Crystal film inducing color change, dynamic control of surface and rotation of microobject; b) "Molecular flagella": single molecular motor controls helicity of dynamic polymer rod. The reversal of directionality of rotary motion of a unidirectional light driven motor was demonstrated (Nature Chem. 2011). Coupling of motor function to catalysis. A molecular motor based chiral organocatalyst was designed featuring light-controlled rotary motion and multiple catalytic functions. This 'multitasking' chiral catalyst allowed for the first time to get the racemate as well as each individual enantiomer of the product of a catalytic transformation depending on input of light energy (Science 2011). This was highlighted recently in Chem&Eng. News (Dec 2011) as a discovery of the year. Molecular 'nanocar': Electrically driven motion of a four wheeled molecule on a metal surface. For the first time it was demonstrated that, using built-in motor functions, a molecular system could be propelled autonomously at the single molecule level along a surface with control of directionality achieved through its stereochemical design. This fundamental breakthrough in molecular dynamic systems was reported in Nature as the front cover article (Nov. 2011) (Figure 6). The work was highlighted in numerous scientific journals, received international press coverage and was highlighted in over 50 international daily newspapers & magazines worldwide, etc. It was selected by the Chinese Academy of Sciences & Academy of Engineers as one of the 10 most important scientific discoveries worldwide in 2011. 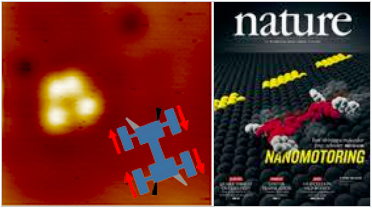 Figure 6:'Four-wheeled Molecular Nanocar' showing electrically driven and directional motion on a Cu surface. Arguably the most important recent advances in our program on motor that were made after the discovery of the first light-driven molecular motor was that the group could demonstrate that nanomotors could perform macroscopic work and that one can drive, through continuous input of (light) energy, a system out of thermodynamic equilibrium and show how one can control movement at the single molecule level. Designing systems that operate under conditions out of thermodynamic equilibrium (mimicking systems in the living cell) is one of the major contemporary and future challenge in chemistry and an important goal of our program on molecular machines is to pave the way towards such systems.